INDIA - Leonardo DiCaprio , left, with Sunita Narain, Centre for Science and Environment, Delhi, right. They discuss and unseasonable rainfall that dropped half of the years rainfall in five hours and destroyed crops in this town. For two years, Leonardo DiCaprio has criss-crossed the planet in his role as UN messenger of Peace on Climate Change. This film, executive produced by Brett Ratner and Martin Scorsese, follows that journey to find both the crisis points and the solutions to this existential threat to human species. The climate change feature documentary ‘Before the Flood’ airs globally on the National Geographic Channel October 30. There has been so much progress that we have done to understand nature and culture and embracing them. And to develop such wilderness our society had given us ‘environmentalists’ who are not only concerned with saving one landscape but have devoted their entire life in saving mother Earth! One such very popular and sharp environmentalist who draws attention of each and everyone by every single comment she delivers is Ms. Sunita Narain. In 2016 her name was listed in “100 most popular people” – of the world by the Times magazine with various other well known personalities like Leonardo di Caprio, Pope Francis, Mark Zuckerberg, and the president of the United States, Barack Obama and many more. “We know the answers to these problems will not be found in the science and engineering textbooks. Focusing on the idea of green and sustainable development. She started her career with an eminent environmentalist Anil Aggarwal as an co-researcher in early 1980’s she worked as a co editor for India’s state for State Environmental report for which she also travelled the whole country seeking data harmonious related between natural resources management and communities. Sunita Narain is currently the director of India based Centre for Science and Environment and also director of the Society for Environmental Communications and publisher of the fortnightly magazine, Down To Earth. She has put in hard efforts and time to raise CSE, a much needed organisation in India for digging deep into community environmental issues and rearing solutions. “This insight into the art and science of local water engineering inspired us to learn more about traditional water practices,” she told that her inspiration for this work came when she saw villages saving each drop of water by building rooftop catchments and tunnels in Rajasthan even 20 years back. Narain has the most vociferous voice among the Indian environmentalists to articulate the interests of developing countries in the global climate debate; she considers the environment an issue of daily survival for millions of poor and indigenous people in a country like India. She thinks that it is important for our us to be a technology agnostic as we do not believe or disbelieve that this technology should answer all questions but such these plans in India are too ambitious and impractical! In one of her many books ‘Towards Green Villages’ she has advocated how participation of local communities and democracy is the key to sustainable development. Sunita Narain has published many other writings ranging from topics Global Warming in an Unequal World, Green Politics: Global Environmental Negotiations, Dying Wisdom: Rise, Fall and Potential of India’s Water Harvesting Systems, Eco regeneration, poverty reduction and since Kyoto Protocol (1997) too she has also worked on numerous articles criticizing the flexibility of mechanisms and climate negotiations. Since the late 90’s, she has worked on a number of articles dealing with policy interventions needed for eco-regeneration of India’s rural environment and poverty reduction. Also she had been the co editor of the State of India’s Environment (1999), The Citizens’ Fifth Report and in 2001, Making Water Everybody’s Business: the practice and policy of water harvesting. Narain has served on board and committees for many national and international organisations and has represented the country at various world level forums on issues of climate expertise. We will have to reinvent the way we work with people and we will have to reinvent growth in a way that is both affordable and sustainable,” she says. For her achievements she has been awarded one of the India’s most prestigious award Padma Shri in 2005 and in the same year the organisation CSE led by her received thth ee Stockholm Water Prize. 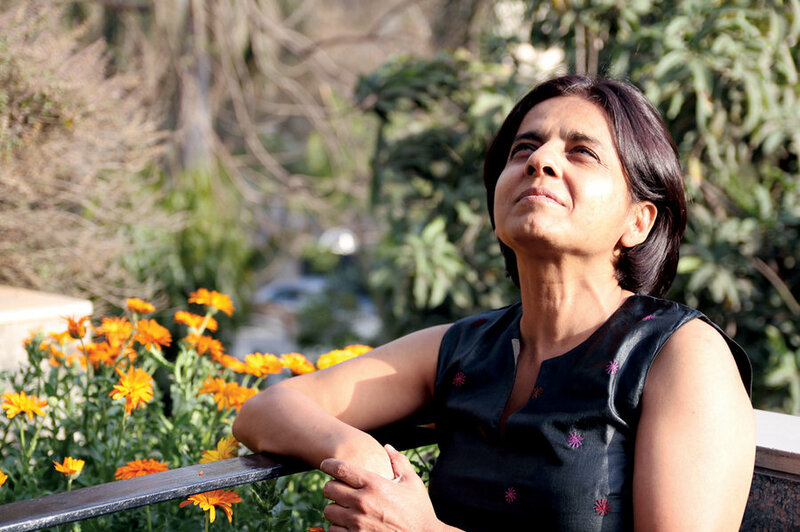 Other prestigious awards that are added to Sunita Narain’s name are the Raja-Lakshmi Award for the year 2009 and the IAMCR Climate Change Communication Research in Action Award (2016). She even chaired the Tiger Task Force at the direction of the Prime Minister. This to evolve an action plan for conservation in the country after the loss of tigers in Sariska. Talking with children on the event of World Earth Day she shares the idea that each year we celebrate Earth Day like the present day and today it is time we asked ourselves whether these ritualistic displays really mean anything. She said us ask ourselves that what kind of environmentalism we are practising today?” Just rethink !! Previous articleDon’t Throw Forests down the bins each day! Choose Recycled Tissue Papers! Next articleOn This Independence Day Pledge To Build A Green Country! Greenhandle is an online ecological printed, unprinted, promotional, non-promotional product store where you can check, customize & order shopping carry bags, paper bags, handmade bags, Eco-bags, boxes, pouches, office products, retail, wholesale products and more..